Costless Tarp's 10x10 Carport Frame Kit is the cost effective option for purchasing everything you need to build your frame but the poles. 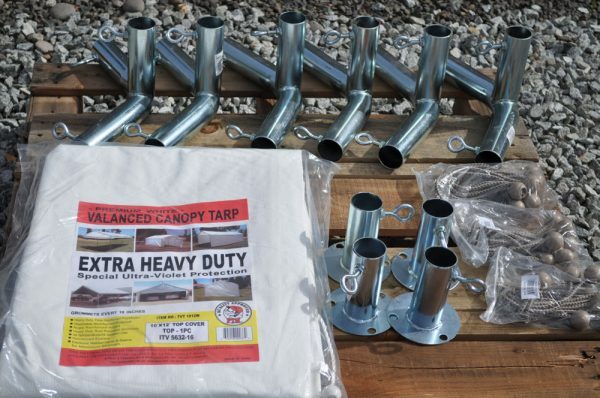 These heavy duty kits require 1 5/8" poles which can be purchased from your local hardware, fence or steel supply store. Live local? 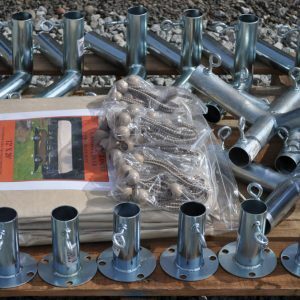 Come to our Southern Oregon retail shop, we carry all the poles needed to build a frame from 10' x 10' to 18' x 100'. 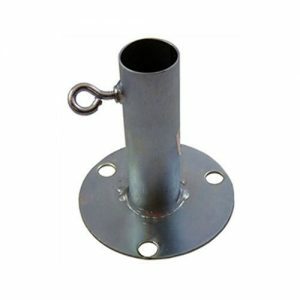 Each kit come with heavy duty 1 5/8" galvanized steel 3 way and 4 way fittings with eye bolts for easy construction, heavy duty 1 5/8" galvanized steel footpads (optional), a 12 mil poly valanced carport cover to fit your kit, ball bungees for cover installation and a list of pole lengths needed for the frame size you want. 10' x 10' Carport Frame Kits are easy to assemble using only eye bolts and a small bar or screwdriver for tightening. 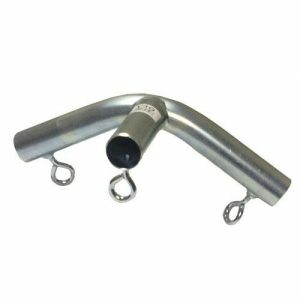 Our heavy duty frame kits are perfect for covering boats, cars, equipment and feed. Use them as elk tents, camping shelters, burning man camps and shade structures. Need a greenhouse solution? Turn a 10x20 frame kit into a greenhouse. Purchase our 12x20 12 mil greenhouse cover kit and a 10x20 frame kit. Have an event coming us? Why rent when you can buy. These kits are expandable to suit your needs. From 10x10 to 18x100, give us a call for your special orders.